One of the downsides of living out of a suitcase for a couple months, is that my swift and ball winder are both currently packed away in my storage unit. The yarn for my sweater project is on cones, so no need to wind any cakes for that project. 1. I could coordinate with a friend to come over and borrow there swift & winder. The downside of this being this would probably take more effort than spending an afternoon digging through my storage unit (though it would also probably be a lot more enjoyable too). 2. I could wind my yarn by hand. The downside being it is not quick process and my calendar is already quite full. 3. I could knit directly from the skein of yarn. The downside being this sometimes feels like flirting with impossible tangles. I ended up choosing door number 3. I don’t knit directly from the skein often, and there are a bunch of pros and cons to this practice, but it’s a damn useful trick to have up your sleeve. : The biggest upside is, you can start knitting immediately. No winding yarn. No setting up equipment. No pulling equipment out of storage. No digging through a storage unit. : You don’t add any extra twist or tension to your yarn. When you wind a ball of yarn, whether by hand or with a ball winder, you add a touch of extra twist and (sometimes a lot) of extra tension to your yarn. This extra twist and tension is generally not a problem, but if it’s a lot of extra, it can lead to some problems. : If you only use a partial skein (like you do when you’re swatching), you can put the skein back in your stash as a relaxed skein, instead of as a tensioned ball. When you leave tensioned cakes of yarn of long periods of time, the yarn looses some of it’s springiness, getting tired, limp, sort of sad. : An excellent technique to use when swatching. If you just want to taste a yarn, or to try out a stitch pattern or new technique, knitting directly from the skein lets you dive right in. : Requires a little bit of attention. Sometimes woolly yarn likes to cling to itself, and silky yarn likes to slip around. So to avert tangles it helps to keep half an eye on what your skein is doing to make sure it’s not slipping and falling out of the skein or clinging to itself and pulling out of the skein. : Takes up a smidge more space than knitting from a ball of yarn. This isn’t really a method I would use on the NYC subway at rush hour, or on a crosstown bus. But generally if you have enough space to sit down and cross your legs, you have enough space to lay out a skein of yarn. : Sometimes I find twisting up a skein with a project still attached highly annoying. This mostly depends on my mood, and how violently I want to twist the skein, and has more to do with the fact that I usually add twist to a skein using both hands. Twisting up a skein with a project still attached is far easier if you add twist with one hand while keeping the other still (the one closer to the project). Despite the cons, and how much it looks like flirting with disaster, knitting directly from a skein of yarn is not difficult. You open up your skein of yarn (an open skein of yarn is called a hank). Place the hank open around your knees, or in your lap, or over your shoulder, or over a chair, or on the table in front of you. Undo the ties tying it together. Take your hank at either end, and twist it back up into a skein. Just like with anything in knitting, it gets easier with practice. : start with a smoother, heavier yarn. That lace weight mohair is not going to make a good practice yarn. : start with a shorter skein. A 200 or 400 yard skeins are far easier to control than 1000+ yard skeins. 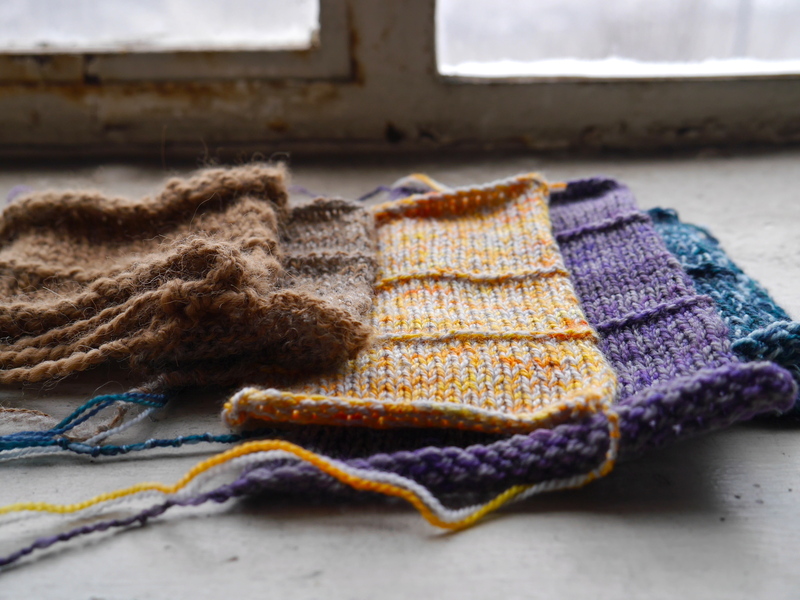 : start with a swatch or a project you can knit in one sitting. That way you won’t have to worry about winding up a skein of yarn with a project still attached. Frankly, if you can wind a ball of yarn by hand without a swift or a ball winder, you can knit directly from a skein. The only difference between the two is winding the skein up between knitting sessions. I’m about 2 skeins and 800+ yards into operation knit all the lime green swatches, and have yet to have a problem. What is the very next step? I am at a place of stuck with my sweater. The body is knit and I am halfway through the first sleeve. I’m beginning to get an inkling that I will need a 3rd cone of yarn, but at the moment I still have a comfortable amount on the cone I’m working from. I haven’t worked on it in a couple days – though I know exactly where I am, and what happens next. I am halfway through the first sleeve. The thing to do would be to continue down the sleeve. That is the very next step. But every time I reach for my knitting I hesitate. Something is not – quite – right. I try my sweater on. Trying on clothing you’ve made is a moment of truth. You’re body knows. Your body knows the minute the fabric touches your skin, whether or not it works for you. Whether or not the time and effort have resulted in a garment you’ll love and wear. Your brain can second guess, and justify, and explain away the short cuts you took because dinner, or drinks, or dishes, or Instagram were calling. Your skin can only feel the shortcut – not the justification. It’s then that you know, if the shortcut worked. Or didn’t. I try on my sweater with half a sleeve and know. Instantly. I can feel the bind off at the hem – too tight. Fixable. I can feel the shortness of the body – not quite long enough. Reaffirming the need for that 3rd cone. I can feel the neck – wide. Low. Fussy. And now we’ve hit the source of my knitting hesitation. I started knitting too deep in the yoke. My cast on was too long. So now the edge curls, and the sweater clings to my shoulders in a way that I am not looking for in this sweater. I tried picking out the cast on and tried a tighter bind off. It’s a trick I’ve used a couple times before. In this instance, it helped, but did not fix the problem. Put the sleeve on a holder. What fabric are you trying to create? One of the things I love about knitting, is that as the knitter, you’re literally making the fabric, (and manipulating it at the same time). Unlike in sewing, where you start with a flat piece of fabric and remove parts of it to create a garment (or bag, or whatever). 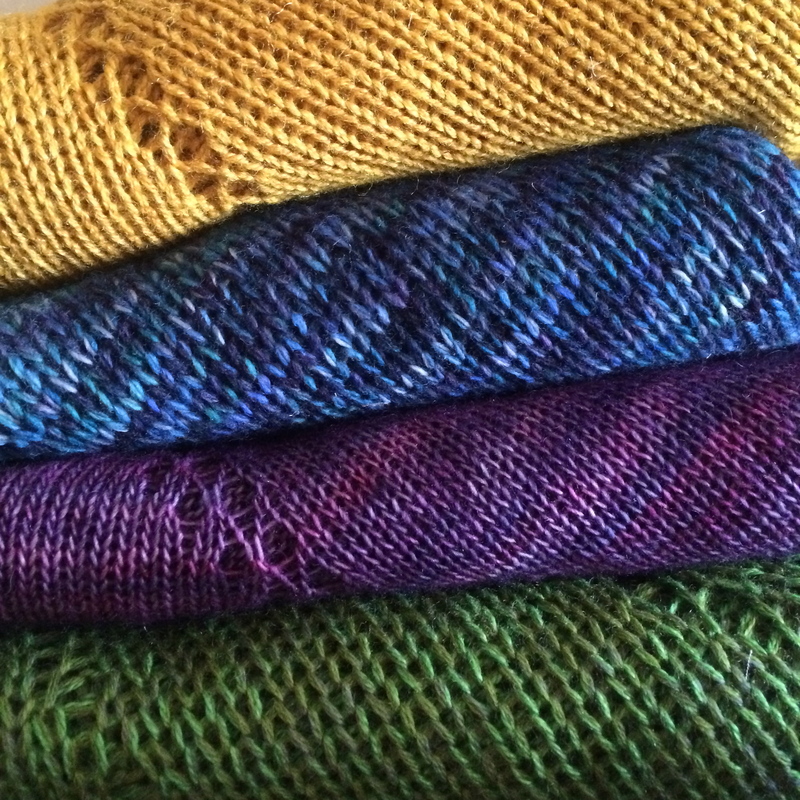 Knitting starts with thin air, and some string – you get to create the fabric from scratch. Each time you knit, you’re creating fabric that has never been created before. This means if you don’t think about & plan your fabric, you get a (not always awesome) surprise. 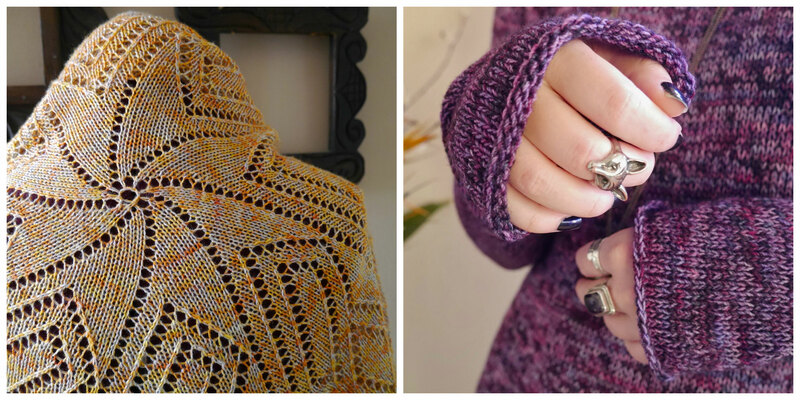 I love lace weight yarn, I knit shawls in it, and I knit sweaters in it, but that doesn’t mean I want the same fabric for both types of projects. For a sweater, I knit lace weight yarn on fairly large needles. For a shawl, I knit that same yarn on much smaller needles. A lace weight yarn I’d knit on a US 2 (2.75mm) needle for a shawl, I’d knit on a US 4 (3.5mm) or US 5 (3.75mm) needle for a sweater. “Ordo” is a lace shawl, knit with 2 strands of lace weigh yarn held together, on a US 5 (3.75mm) needle, while my No So Straightforward Basic Purple Pullover is also knit with 2 strands of lace weight yarn held together, but I knit that on a US 9 (5.5mm) needle. 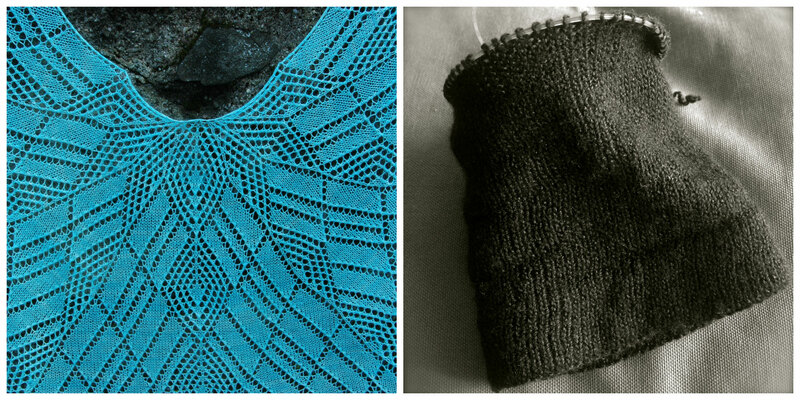 “Tumbling Deco” is a lace shawl, knit with 1 strand of lace weight yarn, on a US 2 (2.75mm) needle, while my Boring Black Sweater is knit with 1 strand of lace weight yarn, on a US 4 (3.5 mm) needle. This is because I want my shawl fabric denser than my sweater fabric. Denser stockinette = crisper lace work. And I want my shawls need to show off intricate lace patterns. dense fabric? drapy fabric? loose fabric? flowing fabric? chunky fabric? thin fabric? textured fabric? smooth fabric? open fabric? etc. etc. What do you want your fabric to feel like?